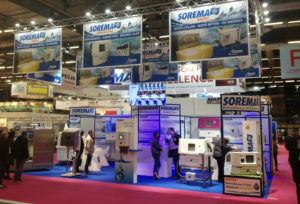 The SOREMA team attended the Europain trade show in Paris to present its “Ecologic” chillers and liquid ice solutions. This show provides an ideal discussion forum with the many different bread-making and installer partners from five continents who come to draw inspiration from French know-how. We also attended the FHA in Singapore for the first time. This was an opportunity for SOREMA to meet various bread-makers from the Asian region. After the summer break, you will have the chance to meet us in Germany. The SOREMA team will be attending the IBA trade fair in Munich from 15 to 20 September 2018.